Researchers from the University of Hawaiʻi at Mānoa were out in force again this month to document and study the king tides that occurred on June 23 and 24. The water level along the coast, already expected to inundate nearshore areas with the some of the highest annual tides was enhanced by elevated water levels and a large south swell that arrived on the same day. The elevated water levels are due to an unusual combination of lingering effects of El Niño, natural Pacific-wide climate and sea level variability associated with the Pacific Decadal Oscillation, localized rotating eddies of elevated water level, and sea-level rise from global warming. 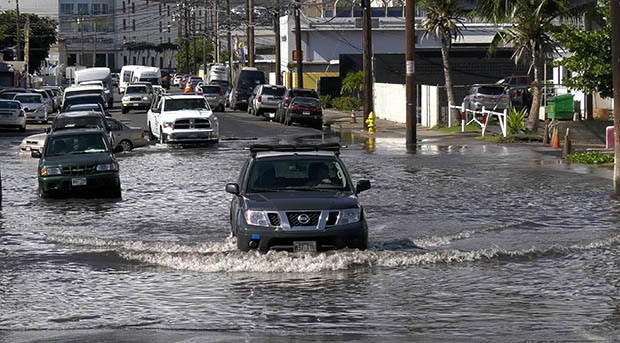 According to the Sea Level Center at the UH Mānoa School of Ocean and Earth Science and Technology (SOEST), the high water levels are expected to continue through the summer. Currently the king tides and flooding associated with the higher water level occur just a few times per year. A recent study by scientists from the U.S. Geological Survey and SOEST found that that sea-level rise will more than double the frequency of extreme water level events in Hawaiʻi within decades. The high tides we are experiencing this summer are providing a snapshot of the future and what will eventually become commonplace. The UH Sea Grant College Program spearheaded a Hawaiʻi and Pacific Islands King Tides citizen science project and has been asking the community for help in capturing photos of the shoreline during the king tides events. In response, more than 200 people signed up to participate in the project and contributed more than 900 photographs during the May 2017 event alone. The photographs provide critical information that allows researchers and decision makers to better understand and prepare for the impacts of sea-level rise. To access these photographs or learn more about the project visit PacificIslandsKingTides.org. To learn more about king tides and find links to additional resources visit HawaiiSeaLevel.org. Video provided by the UH Hilo Center for the Study of Active Volcanoes.